Understanding Labrador Retriever Dogs " "
Have you ever wondered what Labrador Retriever dogs are thinking? You’re not alone. Many dog owners wish that they could somehow find out what’s going thorough there dog’s mind in order to have better communication with them. Since there is no way your dog is going to learn to verbally communicate with you, it’s time for you to look past the impossible and open your eyes to what’s right in front of you – your dog’s body language. Once you learn how to read how your dog is feeling, based on his body language, you’ll be able to better understand your dog’s personality, so you can enjoy the company of one another even more. To help you get a better hand on reading canine body language, the following are a few signs you can look for and their meanings. Aggression – If Labrador Retriever dogs are acting aggressive, their ears will be flattened back, tight to their head. They will narrow their eyes, and the eyes will be glaring or have a challenging look. Their body will look tense, and their teeth will be exposed (the teeth may be bared or simply shown). A Lab will hold his tail straight out from his body, and he will likely be snarling or growling. Dominance – If your Labrador Retriever has assumed a dominant role his ears will be pushed forward, and his mouth will either be totally closed or slightly opened. Their eyes will be wide, or they may be set in a firm stare. Your Lab will look stiff, and will stand tall, and his hackles may raise. His tail will stick straight out in the same way when showing aggression, and he may give a low, assertive bark. Fear – If your dog is fearful, his tail will be carried down, or even under his body. The stance of scared Labrador Retriever dogs is low, almost as if they are in a squatting position. You Lab may also arch his back, keep his head in a turned position and the sclera will be exposed behind dilated pupils. A Lab that barks from fear does so in a tone that is high and sounds worried. He’ll usually only bark if he’s being restrained by something. Friendly – Your Labrador Retriever will look relaxed and welcoming when he’s feeling friendly. His ears will be perky, and his eyes will be alert. His tail will be wagging, and he may even give a quick bark, whimper or yelp to express his excitement and happiness. Playful – If Labrador Retriever dogs are feeling playful, their tail will wag, and they will slightly or dramatically lower their front end, as if they are getting ready to spring up. Submission – If your Labrador is showing submission, his ears will be pressed tightly back, and his eyes will be almost closed. If he has one paw raised, this is a sign of extreme submissive behavior. Furthermore, your Lab may roll on his back and expose his tummy as an indication of extreme submission. Although this is not a happy feeling your dog will enjoy experiencing, it is a sure sign that your Lab will not act aggressively towards you or attack. Stress – If your Lab is stressed his ears will be flattened down to the back of his head or neck. His lips will be drawn back, and he will pant quickly. His body will be hunched forward and his shoulders lowered. His tail will be between his legs, and he may tremble. Worry – If your dog appears concerned he will give rapid, sharp barks and may also growl. His ears will be flattened to his head, and his hackles may be partially or fully raised. This means your dog is sensing something isn’t right. The more you understand the body language of Labrador Retriever dogs, the faster you will be able to respond to your dog and communicate with him. Recognizing body language is extremely important. It can help you help your dog or alert you to what could be a possible dangerous situation. 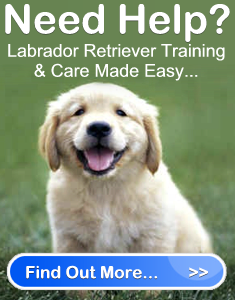 Understanding Labrador Retriever Dogs	Overall rating:	4.8	out of 5 based on 64	reviews.